Hurry! 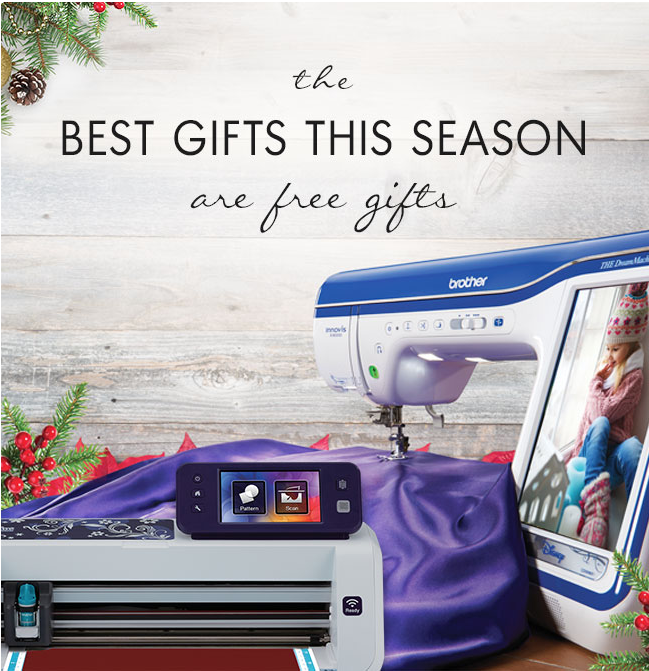 Brother Sews “Best Gifts are Free Gifts” promotion ends December 24th. You are here: Home / Brother Sews / Hurry! Brother Sews “Best Gifts are Free Gifts” promotion ends December 24th. All offers only apply to single-receipt qualifying purchases. Valid on select machines and accessories, and only with participating Authorized Brother Dealer locations made between November 1 and December 24, 2017. Specifications and pricing subject to change. ‡Dealer Discount with purchase is fulfilled at time of purchase by Fabrics Galore and Quilting Store. Prices set by dealer may vary. #Allow 8 weeks for receipt of the ScanNCut2 CM650WX. Limit one claim per model per person, household, family or address. Refurbished or used machines do not qualify. Brother International Corporation reserves the right to substitute another product of equal value in lieu of ScanNCut2 CM650WX at its discretion. *Offer applies only to single-receipt qualifying purchases. $5,000 minimum purchase required. Software and accessories are not included in the financing offer and must be purchased separately. Subject to credit approval. No interest will be charged on promo purchase and equal monthly payments are required equal to initial promo purchase amount divided equally by the number of months in promo period until promo is paid in full and only applies to the selected financing options shown. Minimum monthly payments required to pay off total balance of purchase. The equal monthly payment is equivalent to promo purchase price (excluding taxes and delivery) divided by number of months in the promotional period, rounded to the next highest whole dollar, and may be higher than the minimum payment that would be required if the purchase was a non-promotional purchase. Regular account terms apply to non-promotional purchases. For new accounts: Purchase APR is 29.99%. Minimum interest charge is $2. Existing cardholders should see their credit card agreement for their applicable terms. If you make your payments by the due date each month, you should be able to pay off this purchase within the promo period if this balance is the only balance on your account during this promo period. If you have other balances on your account, this monthly payment will be added to the minimum payment applicable to those balances. Prices set by dealers may vary.